This Verticordia is an open shrub growing to around 80 cm (21/2’) in height, with clusters of deep pink flowers. The petals have undivided finger like extensions (around 2 mm or 3/32” in length), but are divided on the (primary) petal-like calyx (immediately below). With Verticordia tumida the hairless calyx tube has additional green herbaceous lobes that fold down against the calyx tube, but are usually hidden under the pink petal-like calyx lobes. 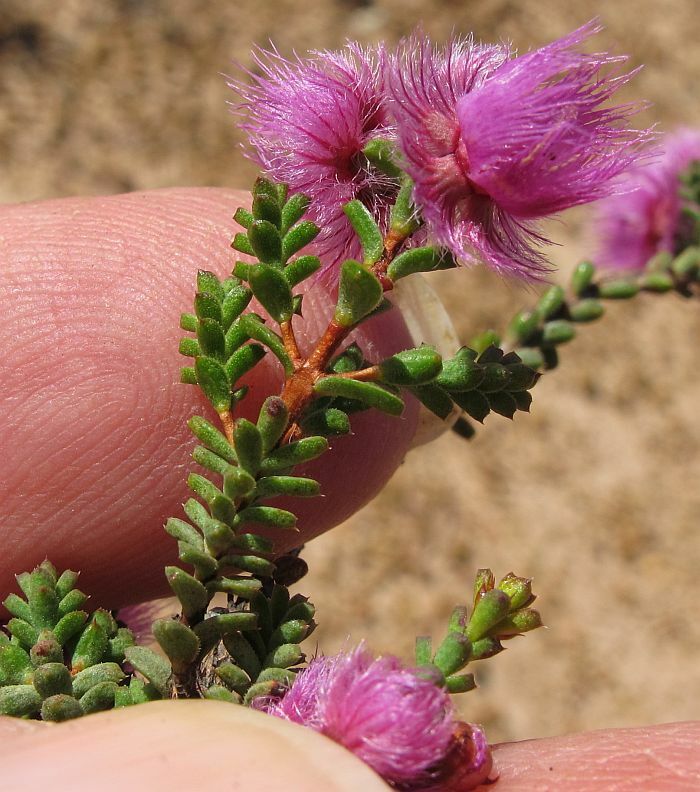 There are two Verticordia tumida subspecies, with the other subsp. 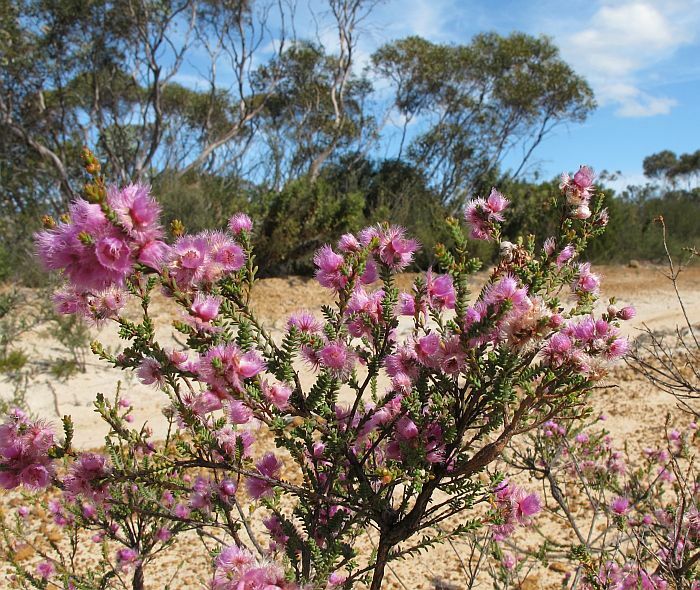 tumida mainly to the NNW of the Wickepin district (250 km or 155 miles NW of Ravensthorpe) so well outside the Esperance region. They differ most obviously by the number of reflexed herbaceous calyx lobes with subsp. tumida having 9 or 10, plus a constriction at the base of the calyx tube. Subsp. therogana has only 5-8 lobes and no construction of the calyx tube. 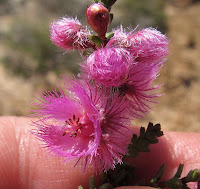 Verticordia tumida subsp. 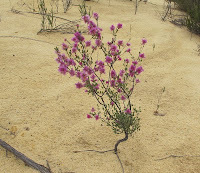 therogana occurs mostly inland, especially in sandy soils sometimes over gravel. It is common on East Mt. 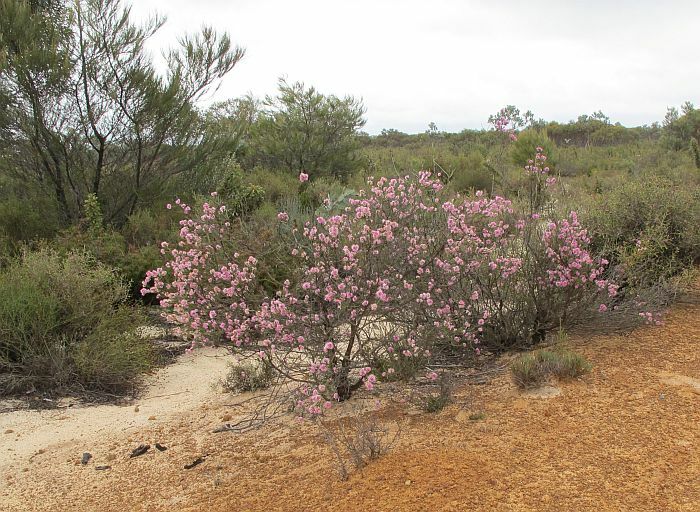 Barren south of Ravensthorpe, then NW to Wickepin, turning NE to Southern Cross, where it dips SE to Peak Charles (130 km or 80 miles NNW of Esperance). 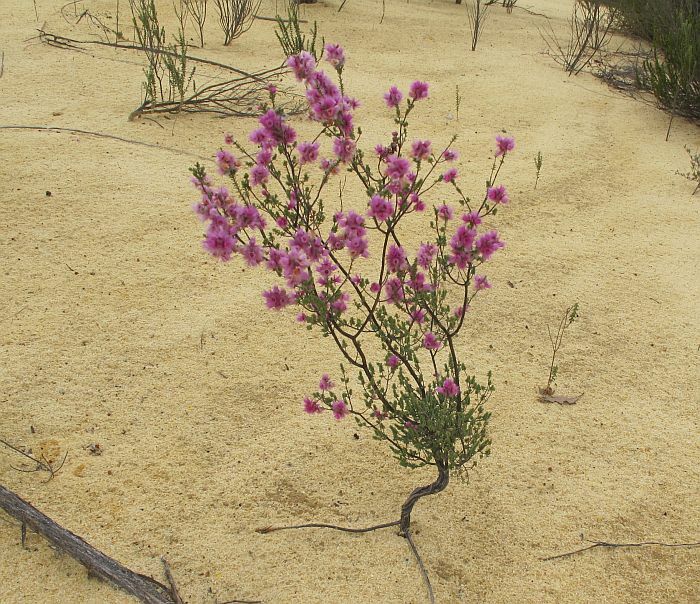 Another Verticordia species (V. pennigera) is easily confused with Verticordia tumida and which overlaps for much of its range, but is not currently recorded from the Esperance region, occurring just outside to the west. 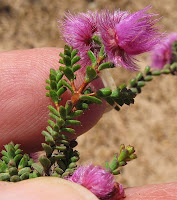 V. pennigera differs most noticeably by having shorter finger like extensions on the petals (only 1 mm in length), as compared with Verticordia tumida that are twice as long. 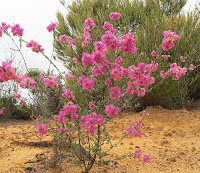 Most Verticordia spp. 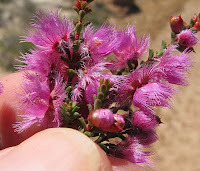 are long flowering plants and Verticordia tumida subsp. 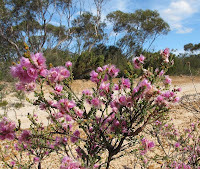 therogana is recorded flowering from October to May, although locally it tends to bloom a little later from November. The subspecies name of therogana, refers to the bright flowers that bloom through summer ~ theros = Greek for summer and ganos = brightness. The Verticordia genus belongs to the large and highly diverse Myrtaceae family. 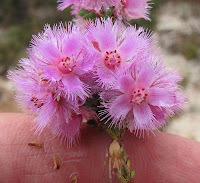 My thanks to Shaun Tennant a Verticordia enthusiast, for bringing this species to my attention. New taxa, combinations and typifications in Verticordia (Myrtaceae: Chamelaucieae). By A.S. George. WA Herbarium. Nuytsia Vol 7. No 3 1991.